Check periodicaly for future modifications/recomendations. This is the basic wiring. 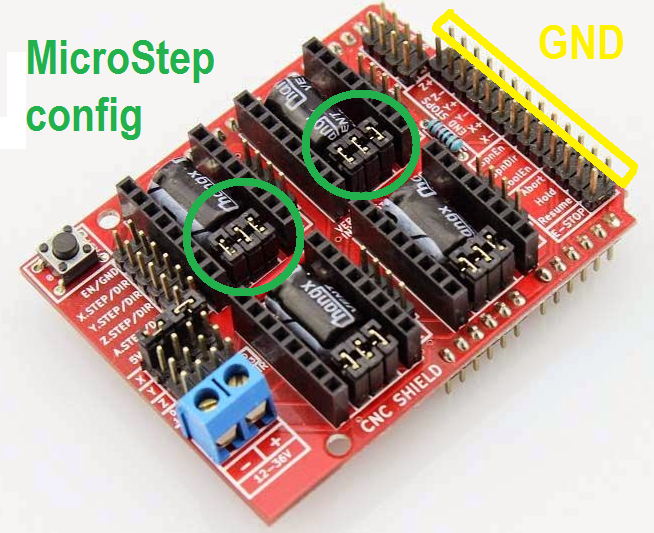 As mentioned, EndStops are optional, If you don´t use it, leave pins unconnected (firmware is configured to use Normally Open contacts for EndStops). Don´t connect the laser before full tuning the laser driver. NOTE: Take care, since CNC shield v3.1+ boards, the PCB has been updated and the Z+/Z- endStops and SpnEn pins has been swaped and are now correctly labered for using with GRBL v0.9+ like 3dpBurner, so if your board version is v3.1 or higher connect the PWM wire to SpnEn pin instead to Z+ pin as on previous CNC v3.0 boards. Check here for more info. Each axis has 3 jumpers that can be set to configure the micro stepping for the axis. Standard mount use only two axis, so you need to configure these jumpers for 16 microsteps. For the Pololu A4988 based drivers, these jumpers should be all inserted. If you use other driver type (ie: DRV8825) configure them for 16 microsteps. On the CNC shield the X- and X+ pins are the same electrical point in similar way that Y- Y+ and Z- Z+. Note the edge side pins of this "socket" are all tied to GND. -If you want to use two motors for any axis (ie: larger Y travel) you can "clone" any axis for use two motors and two drivers for a single axis. The CNC shield is ready for this!. Check this for CNC shield extended info. -The Arduino board is powered by the USB socket and the VCC applied to the CNC shield is only for motors. As you can see, the laser driver can be powered by a power jack or a JST connector, are the same electrical points. Also it has a builtin rectifier, so no polarity need to be taken for powering it (only for powering it). 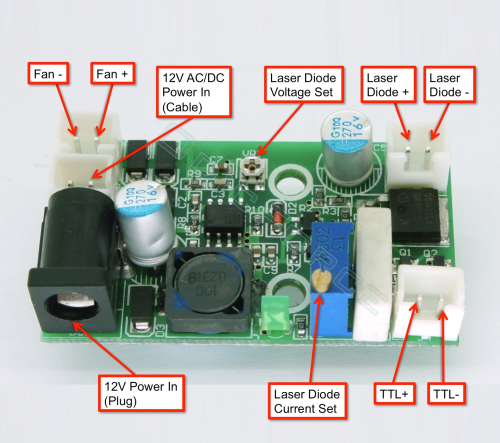 Laser driver provides a 12v output for powering the fan, but i prefer to connect it to power supply side for prevent electrical noise or similar. 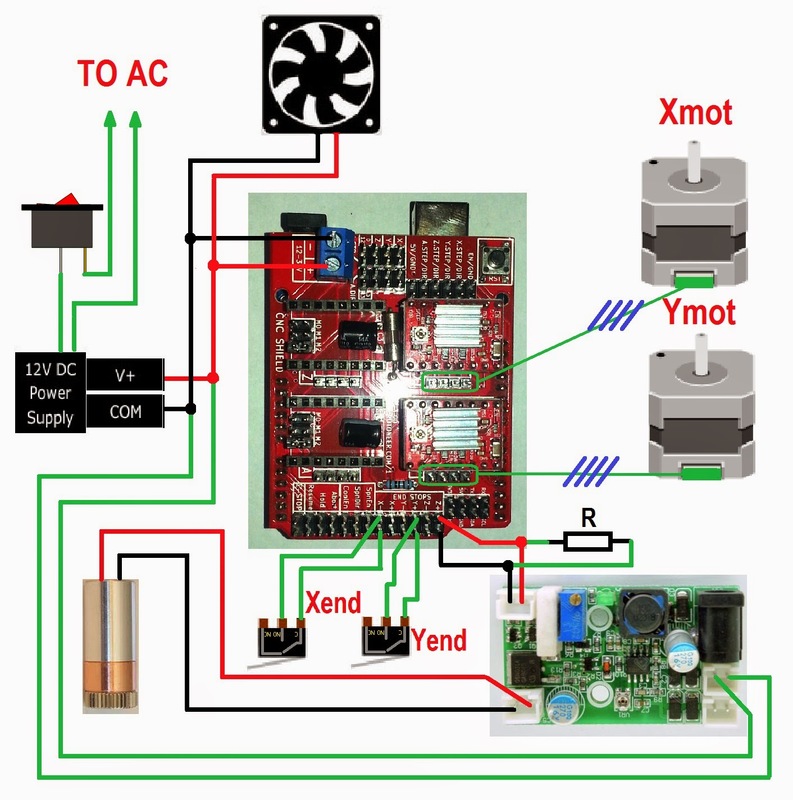 The fan is always running when power switch is on (is possible to use a Arduino controlled relay). The PWM input of the laser driver (take care polarity) is connected to the Z+/GND pin (or Z-/GND is the same electrical point). This is not a error, GRBL 0.9+ remapped this pin to be used as PWM output capable for driving a variable spindle (or laser for this case). You can use the 3D printed bumpers and some double sided tape for fitting onto base table. 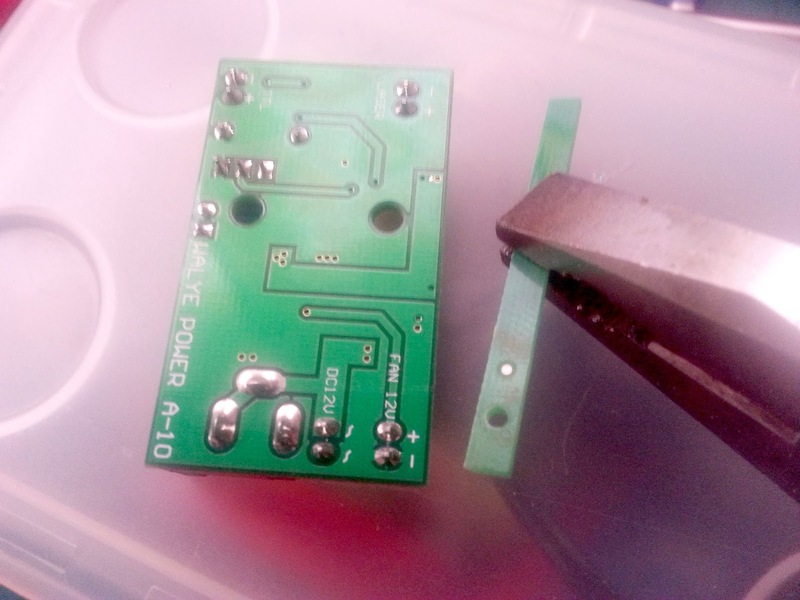 Note some sellers send the laser driver with a "bigger PCB", this is only a unfinished PCB cut and you can use a pliers for breaking the tab. This is the method i used for my machines and works fine for me. The laser driver must be without laser attached, powered, with the "TTL+" pin tied to 5v pin from Arduino and the "TTL-" pin tied to 0v, or if you have the firmware running, and the driver PWM input connected, you can simply send the M3 S255 command for apply 100% of the PWM dutty cycle to "TTL+" pin. Check the driver PWM input with the voltmeter, it should be at 5v between "TTL+" and "TTL-" pins. Then put the voltmeter on the driver laser output and adjust the voltage to 7.5v by using the voltage trim pot (Voltage Set). After done, set the current trim pot (Current Set) at min by turning it counter clockwise several turns. NOTE: Take care the current potentiometer is a multi-turn type, so you need several counter clockwise turns for setting to minimum (you can hear a wear "click-click" when done). This part needs to be updated, it doesn't works on some drivers, you can go here for a good guide about testing and pre-tuning the driver. Thanks OdicForce lasers for the tips. Connect the ammeter to the laser output (short) and check the current can be adjusted by playing with the current pot, if all is ok, set the current pot again at min and turn off the power switch. Short the driver output pins (where ammeter was) to bleed the output cap for residual charge. 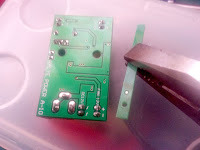 This must be done always prior to connect the diode to the driver. In case of residual charge, the spike can fry the diode. Connect the laser module (take care polarity) and the ammeter in series for checking the laser current set point. Apply a little hot gun to secure the driver quick connects, if there is any intermittent contact when running, the output caps can spike the diode. Wear you safety glasses and apply power, send the M3 S255 command again and start slowly tuning clockwise the current pot checking the laser beam, it should be visible shortly, if no visible after some turns, re-check all connections... See the ammeter and adjust until you get the desired current (1.65A on my case). *Some people are reporting issues with these chinese drivers not working as expected (i think is a bad quality control), so don't connect the laser if any of the above steps did not was as described. *The NDB7875 diode has a ESD protection built in, but if you use other laser diode type take care with this, you can fry it simply touching it with your hands. 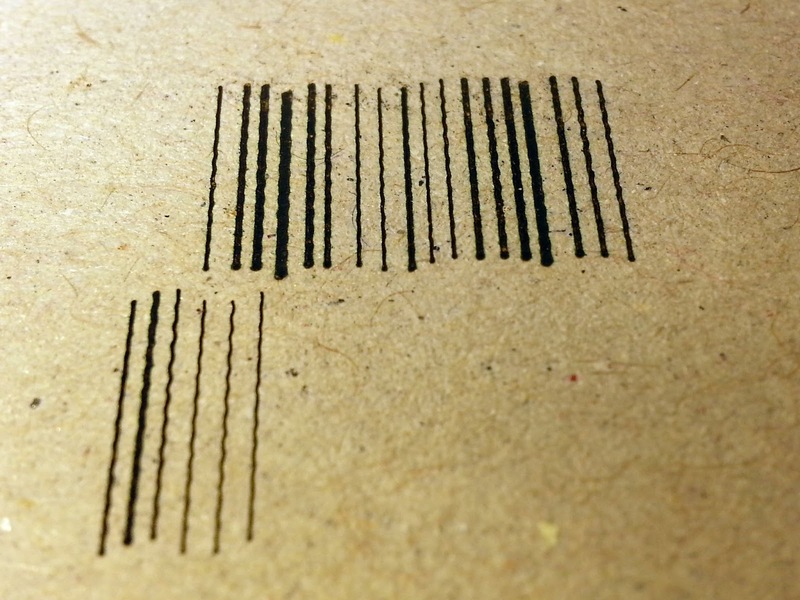 The best focus is the smallest possible beam point, this can be done by engraving several lines and turning in/out the lens on each one until you get the best results. Once done the lens should not be moved anymore. If on any time you want fatter lines you can unfocus the laser simply using differents gauges for setting the lasser height. -My lens must be almost unscrewed, and i use teflon tape on lens thread for prevent accidental movements. 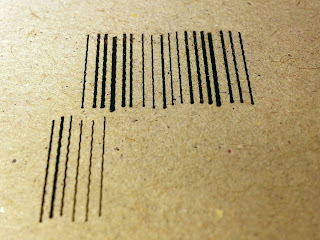 -For tuning i engrave 10mm length lines on cardboard, at full power (S=255) at 1000 mm/min, adjusting 1/4 turn on each test. -For fine tuning i take pictures with my phone in macro mode, and check the line thickness adjusting about 1/8 - 1/16 turn on each new line.